Don’t let cold spring breezes freeze your good intentions to get organized. For many, the annual cleaning ritual is about to begin. So I propose it’s also a perfect time to tidy up some of your zeroes and ones. Just because your digital files don’t take up a lot of physical space doesn’t mean they’re not cluttering up your life! Have you lost an important email recently? If so, I bet you’ve got too much hanging around. Let’s face it… you don’t need to hold onto most of your personal email. Much of it is probably unwanted marketing messages anyway. And if you’ve got thousands of unread emails stacked up, that’s also a sign it’s time to thin out your in-box. My favorite way to keep the job manageable is to simply sort by sender, select huge email chunks, and then delete away. You’ve got to regularly go through them on your computer and organize them into content buckets. And to be really effective, you’ve got to delete the mediocre pics. I think rolling up your sleeves once a week should do it. Here are a few tips on getting the task done. Have you realized that SD cards have become so inexpensive? 16GB Class 10 SDHC SanDisk flash memory card for $11.89. Originally, the magic of digital photography was the mind-blowing concept that it didn’t cost you anything to snap a photo. You’d just delete the older photos on the card and your camera could keep on going… forever. But no matter how much memory your card’s got, it does eventually run out of space. Because who’s really got the time to pay attention to how many megs are left? It takes some ongoing effort to delete the hundreds and sometimes thousands of photo and video files… unless you want to simply clear the whole card and start over. Have you ever found yourself struggling to quickly delete the old photos off your camera’s SD card right before you want to capture a priceless moment? Don’t try to keep up with your nearly filled memory card. When it’s time, just replace it. 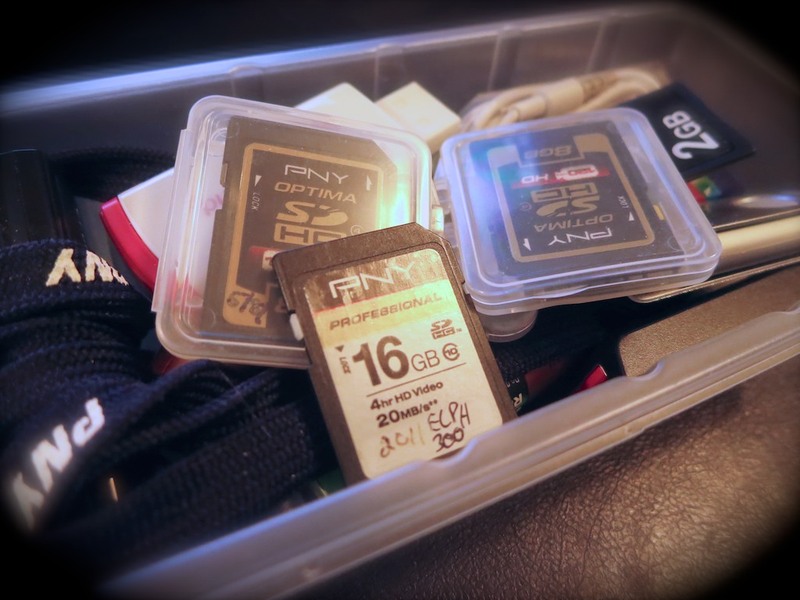 It’s okay to buy new SD cards every so often to make sure your camera is ready for action. Sure, that’s a bit wasteful, but it’s not like having a tiny stack of old SD cards lying around is going to mess up the house. Plus, SD cards don’t last forever. So it’s probably a good idea to recycle out the older ones every couple of years. Nobody wants to take the time to update your software. But you’ve got to do it! I’m not saying you should be the first to install an update. If you haven’t yet converted all that old content off your dusty tapes into digital files, it can’t be that important. Remember that new piece of tech you recently bought? Register it online now, while you still know where the receipt is! If you’ve got all of these digital projects already handled, congratulations. So let me throw one more task onto your ‘to do’ list. Are you caught up on making all those photo albums you’ve been meaning to create online?